~Fallen Leaves, by Billy Talent. Wow..This is just stunning and beautiful!All the water and sparkles.And Fallen leaves expression.It all just wraps up together. The feel of this artwork is very inspiring, and gives you the sense of drama. The waves fit perfectly, the 'Bird Jayfeather' and also the lighting and reflection. Did you mean Omg? (Oh My god) I see that you speak Russian or Ukrainian? I am Russian, Although I can't speak or Write/type it. Я имела в виду удивление, звук "омг". Круто! Я не родился в России, я родился в Британской Колумбии, Канада. Я надеюсь посетить Россию в один прекрасный день. Хотя я молод, * 11 *: L, но я. Надеюсь, что вы можете прочитать это. Wow, I'm glad you made this! I don't see many artists making this scene! The water is beautiful, too! great job on the water!!!!! beautiful!!! Love how you did the water, and Fallenleaves' fur! This is truly an amazing work of art that deserves more attention. This is incredible! The emotion! The shading! everything is stunning! 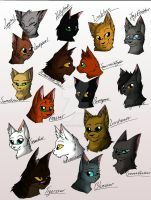 I LOVE how you portrayed Jayfeather. :3 Really unique and amazing. Wow. I can't begin to describe how much I love this. But it's amazing. Wow, nice! I love how you portrayed Jayfether! Why haven't more people seen this? I`m glad to hear it from you ! Thankee !